Located just a few steps from the famous beach of Maspalomas, this luxury boutique hotel combines world-class comfort with all the amenities demanding guests have come to expect. The Salobre Hotel Resort & Serenity is a 5 star hotel in the south of Gran Canaria, very near Maspalomas, in a perfect piece of the countryside, giving you a feeling of freedom and helping you to completely unwind and get away from it all. Seaside Palm Beach is surrounded by a fabulous palm tree oasis on the edge of a nature reserve. In the immediate vicinity you will find a five-mile long golden beach and the famous dunes of Maspalomas - everything within easy walking distance. Maspalomas, San Agustin - 4 Star. Hotel Costa Canaria & Spa is designed for adults only, it is located on the Playa de San Agustin beachfront, at the north of Gran Canaria. 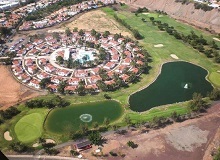 eó Suite Hotel Jardin Dorado is located in the golf course of Maspalomas, near the dunes of sand. It offers outdoor swimming pool and luxury junior suites with private garden, it has a small gymnasium, a sauna and, in winter and a heated swimming pool with hydro massage. 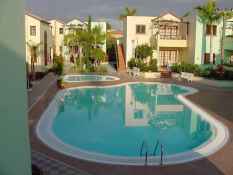 Sol Barbacan is located and only a couple of minutes away from the beaches of Playa del Inglés and Maspalomas. Renovated in 2015, the large-scale facilities and the apartments and bungalows make it ideal for families, couples and groups of friends. This hotel in Maspalomas stands out for its refined modern architecture, which fits in well with the spectacular lighthouse and the cosmopolitan atmosphere of the seaside promenade. Situated in the south of Gran Canaria, in the resort of Maspalomas, set in serene and stunning surroundings, this is a friendly and relaxed self-catering resort where you will feel at home the moment you walk through the doors.